The American League East has long been considered the best in baseball for much of the new century. The division has sent 2 teams to the playoffs every year since 2007. With Tampa Bay’s emergence as a yearly contender, Toronto’s steady improvement, and the annual Yankees-Red Sox battle, the division boasts four serious contenders for the playoffs going into 2012 as well. Let’s take a look at each of these teams chances in 2012, as well as the chances of the Baltimore Orioles, who will more than likely spend their 5th season in a row in last place. Teams are listed by their 2011 standing and all statistics listed are from 2011. The New York Yankees’ offense is loaded, possessing some of the best players from last season and some of the best relics from the past decade. The 2012 lineup will revolve around Curtis Granderson, Robinson Cano, and Mark Texiera, as it did last season. Granderson and Cano were exquisite last year, with each player finishing in the top-6 in MVP voting. Granderson in particular was a run producing machine last season leading all of baseball in runs scored with 136 and leading the AL in RBIs with 119. He was the perfect package of power and speed, complementing his 41 homers with 25 stolen bases. The Yankee lineup as a whole mirrored Granderson leading baseball in homeruns while finishing 4th in stolen bases. Mark Texiera, Nick Swisher, and Alex Rodriguez are all proven power commodities, so expect New York to once again finish near the top of baseball in home runs and runs scored. Teams who score more runs tend to have a greater margin for error in the playoff race, so the Yankees will be a factor all season. The unsung hero for the Yankees is leftfielder Brett Gardner. Last season Gardner ranked as the best defensive outfielder, if you believe in the metrics, and was easily passes the eye test as a standout glove man. Gardner led the American League in steals a year ago and he transfers his superb sp eed over to defense as well. No player covers more space in the outfield, and his arm is more than adequate out in left. He would best be utilized as the leadoff hitter, but manager Joe Girardi seems inclined to use Derek Jeter in the spot once again. Jeter will still provide leadership, good at-bats, and base hits but his days of driving the ball with power to all fields are behind him. Look for this lineup to once again be elite and to produce another 850-900 run season, putting it near the top of the league. Teams who score more runs tend to have a greater margin for error in the playoff race, so the Yankees will be a factor all season. The Yankees biggest issue last season was starting pitching and GM Brian Cashman spent most of the offseason trying to shore up that weakness. The Yankees staff, led by CC Sabathia and a fierce bullpen, was borderline elite however, allowing the 10th fewest runs in baseball. If the acquisitions of Michael Pineda and Hiroki Kuroda as well as the return of Andy Pettitte give the Yankees the deepest staff in baseball. Sabathia will more than likely repeat what he’s done the past few season which is good for about 19 wins and a low 3.00 ERA. Replacing 190 sub-par AJ Burnett innings (ERA+ of 86 last season) with anything around average should do wonders for New York and add a couple wins on last years total as well. If Phil Hughes continues to pitch as well as he has in Spring Training, he will give the Yankees a potent rotation 1 through 5. His velocity has been sitting around 92-94, up 6 mph from a year ago, and he’s weighs about 15 pounds less. The Yankee bullpen was the strength of last year’s team and should be excellent once again. Led by Mariano Rivera and David Robertson the Yankees posses two of the five most valuable relievers in all of baseball from last year. The Yankees will be tough to beat once again if they take a lead into the 7th inning. Overall this team appears to be stronger than last year’s edition, which won the division and finished the regular season as the #1 seed in the playoffs. The Yankees will probably finish with a top-5 offense and a top-10 pitching staff which is a recipe for another playoff birth. With the largest payroll in the game nothing less than a title is expected in New York and October is where this team will be judged. The 2011 Tampa Bay Rays will forever be remembered for their incredible comeback to pass the Red Sox for the final playoff spot. The team was formidable, possessing the best pitching staff in the American League and winning 91 games. The 2012 edition looks to be a strong contender for a repeat appearance in the playoffs, but much of their success will come down to scoring enough runs. The Tampa Bay offense was middle of the pack a season ago, finishing 8th in the AL in runs scored. Teams with that sort of scoring capability rarely make the playoffs. The good news for the 2012 team is that they should be a bit more powerful and could be getting some bounce back season out of their most talented player Evan Longoria. Longoria struggled with his batting average somewhat last season, hitting only .244 with his Batting Average on Balls in Play, BABIP, sitting at a paltry .239. The league average is .300. This means that Longoria was probably somewhat unlucky last season and should see improvement with his average. That could mean an increase in his power numbers which were already substantial last season, seeing as he hit 31 homeruns. The rest of the Tampa lineup is a grab bag between low average/high power players like Carlos Pena, and speed types like BJ Upton or Desmond Jennings. Jennings had some solid success during his 63 game stint with last year’s Rays team. He stole 20 bases at a solid 77% success rate, while hitting 10 homers, and showing a good glove in the outfield. He will have a much more increased role on the 2012 team and could improve the offense by stealing more than 40 bases and hitting for 15 or so homeruns. BJ Upton and Matt Joyce round out an above average defensive outfield and each player brings some pop to the plate. Another important player for Tampa Bay is utility superstar Ben Zobrist. Zobrist spent most of 2011 at 2nd base after spending most of 2010 in the outfield. He perfectly fills any defensive role that manager Joe Maddon needs, playing well at any position. In addition to playing excellent defense around the diamond, Zobrist brings a multi-dimensional bat to the plate as well. He can draw a walk, with two career seasons of 90 or more, he can hit for power, with two seasons of 20 or more homers, and he can steal bases, averaging 20 over the last 3 seasons. He’s an extremely useful, versatile player that any big league manager would love to have. The Tampa Bay pitching staff was the best in the American League a year ago and could be even better in 2012. Matt Moore, hero of their lone playoff win, should pitch at least 150 innings after only receiving 9.1 during the regular season last year. He has ace potential, in before 2011 he was the highest rated minor league pitcher by Baseball America, and is not the only one on the staff. 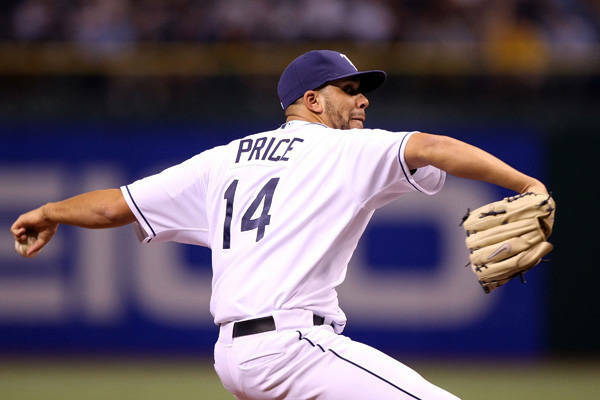 David Price, Cy Young runner-up in 2010, is also a near lock to throw 200+ quality innings. I expect that his 2012 will be another Cy Young worthy campaign, and he could win as many as 20 games while striking out over 200. James Shields had his strongest season of his career in 2011, and will look to repeat that in 2012. He had a 2.82 ERA last year and gives the Rays a three headed monster at the top of the rotation. In addition to being top heavy the Rays have enviable depth as well, with Jeremy Hellickson, Wade Davis, Jeff Niemann, and Alex Cobb all competing for a starting spot. If the bullpen comes together as it has the past 2 season behind Kyle Farnsworth, the Rays will again allow the fewest runs in the American League, and remain a threat to win 90+ games. Boston has had an interesting offseason to say the least. The chicken and beer thing has become a national joke that just won’t die, Theo Epstien left for Chicago, Bobby Valentine was hired to bring some order back to the clubhouse, and closer Jonathan Paplebon left town only to be replaced by Andrew Bailey. In addition John Lackey went down for the year, Daisuke Matsuzaka won’t pitch for the big league team until May at the earliest, and Andrew Bard is being brought into the rotation. On the offensive side of the ball however the Red Sox should be just fine. They ranked first in baseball in runs scored and have the firepower to do it again. They’re led by a fierce top of the order featuring Jacoby Ellsberry, Dustin Pedroia, Adrian Gonzalez, and David Ortiz. Gonzalez and Ortiz each brought the power last season, with both ranking in the top 10 in baseball in OPS+, a key indicator for sluggers. Gonzalez hit a massive .338/.410/.548 slash line with 45 doubles and 27 homers. If the power numbers return to previous norms (he once hit 40 homers playing half his games in cavernous Petco Park) he could lead the league in homeruns. Jacoby Ellsberry is also a good bet to repeat much of his strong 2011 season which saw him massively increase his power hitting 32 homers and driving in over 100 while mostly hitting leadoff. The Red Sox lineup could also see some improvement on last year’s run total if some players such as Kevin Youkilis and Carl Crawford improve on disappointing seasons in 2011. Youkilis was still an All-Star a season ago but he only played in 120 games, marking the 3rd straight season he’s missed 25 games or more, and was abysmal after the break. In the second half he only played in 37 games an hit an unplayable .199/.314/.346. If his play over the course of the season resembles what it was during his first half, a more robust .285/.399/.512, and he stays healthy the Sox lineup gets a quite a bit tougher. Crawford’s struggles a season ago were well documented. He seemed to lose all his speed, all his bat speed, and all his range in the outfield all at once. The Red Sox better hope 2011 was just an aberration because they are still on the hook for 5 more seasons at about $20 million a year. Last season it wasn’t the Red Sox offense that let them down but their pitching, which ranked 21st in baseball. Teams who have a bottom-10 offense or pitching staff rarely make it to October, so what happened to Boston at the end of last season was not a fluke. A season ago Boston gave 310 innings to John Lackey, 6.41 ERA, and Tim Wakefield, 5.12 ERA. The fact that both pitchers were still able to finish with records around .500 is a minor miracle and a testament to the strength of the Boston attack. The Red Sox intend to replace those innings with at least 75 more from Clay Buchholz, and the rest split between former relievers Daniel Bard and Alfredo Aceves. Clay Buchholz, when healthy, has the potential to be a #2 pitcher. In 2010 he led the American League in ERA+ at a phenomenal 187(ERA was 2.33) while throwing 173 innings. Last season he pitched moderately well in the 80 the Red Sox got out of him, posting a 3.48 ERA. If the Red Sox could get even that out of Buchholz they will be able to add 2-4 wins and get a playoff spot. If either experiment with Bard or Aceves works the Red Sox will have a solid rotation provided that neither Lester or Beckett decline too much. Beckett is going into his age 32 season and could begin to see some slip in his performance, which will be worth keeping an eye on. 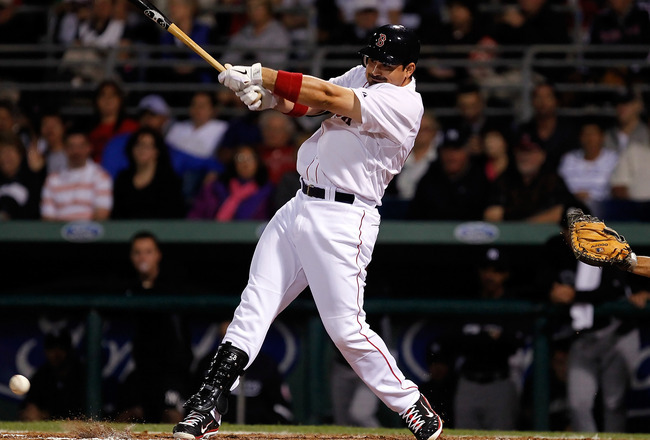 The 2012 Red Sox looked prime for a comeback and return to the playoffs after a 2 year absence. The team will once again have an elite offense capable of keeping them in any game. The bullpen may be a spot of weakness, with the loss of so many quality arms from a year ago, but if Andrew Bailey can handle the Boston spotlight, it should be around average as a whole. The media will more than likely hail Bobby V if he guides this team to the playoffs, but he will have very little impact on that. Boston will only go as far as its pitching can take them, which should be good enough for the playoffs. Remember this team had an expected record based on runs scored/against of 94-68 a season ago and has the offensive talent to win about that many games regardless of pitching. Toronto, much like the Red Sox, was an offensive powerhouse being held back by lousy pitching. The Blue Jays produced an elite 743 runs, good for 6th in baseball, but finished an awful 25th in runs allowed. The team was rumored to be interested in Yu Darvish in the offseason, but with Texas winning his rights the Jays will go into 2012 with a similar rotation to the one that got battered last season. Ricky Romero was the lone bright spot on what was otherwise an entirely above league average staff. Romero posted a 2.92 ERA pitching against some of baseball’s best offenses and struck out 7 batters per 9 innings. The rest of the under-28 rotation returning, Brendan Morrow and Brett Cecil disappointed a year ago. Morrow has shown great potential, striking out an elite 10+ batters per 9 the last 2 seasons he’s pitched. His issue appears to be control, where he is walking 3-4 batters a game. His walk rate has improved over the past 3 seasons so maybe this is the year he puts it together and breaks out as a true ace. The bottom of the rotation is currently comprised of youngsters Henderson Alvarez and Dustin McGowen. Neither pitcher has been considered much more than bottom of the rotation filler coming up through the minors and those type of pitchers tend to get hit hard in this division. Toronto’s best shot at competing this season is going to be improvement from within, as the team was quiet on the free agent market offensively as well. The Blue Jays offense has been fairly robust the past 2 seasons, led by the surprising emergence of Jose Bautista. Bautista has led baseball in homers each of the past 2 years hitting a combined 97. His slash line last year was an absurd .302/.447/.608 and he led baseball with an outstanding 181 OPS+. Pitchers fear Bautista more than any other hitter as well, walking him a league leading 132 times in 2011 after 100 walks in 2010. His production is real and will not just disappear overnight. Bautista will be one of the most frightening hitters to face for any American League pitcher. The rest of the offense is still young and features Brett Lawrie, Eric Thames, and Colby Rasmus. Rasmus was received in the Edwin Jackson trade that pushed St. Louis over the top in 2011 and struggled badly in adjusting to life in the AL. He hit .173 after the trade slugging only 3 homers in 35 games. He will have to improve his numbers in 2011 or risk being considered a bust at the age of 25. 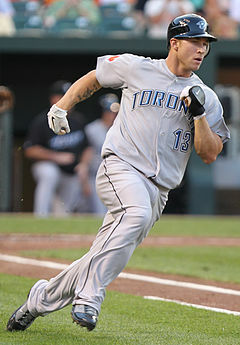 On the opposite end of the spectrum last year was Canadian-native Brett Lawrie, who immediately became a fan favorite. In Lawrie’s 45 game stint, the 12 year old hit .293/.373/.580 and could be a future star at 3rd. He has good power, hitting 9 homeruns, and good speed, stealing 7 bases in a neat 8 attempts. If he continues to improve Toronto will have 2 mashers in the middle of their lineup. Overall the Blue Jays are probably looking at another year in 4th place. The team just doesn’t appear to have the pitching to compete with the rest of the American League field, even if Morrow improves and has a breakout season. Had the team been able to acquire Darvish the outlook might be different, but the Blue Jays will just have to wait until next offseason to get a big name pitcher. There hasn’t been a whole lot to get excited about in Baltimore for the past decade. The franchise is completely broken at this point and in dire need of repair. They hired Dan Duquette, formerly of the Boston Red Sox from over a decade ago, to be their GM this offseason and the move was widely met with question marks. The roster he inherits is mostly bare possessing only a few usable assets in Matt Wieters, Adam Jones, and JJ Hardy. The pitching staff is a wasteland where arms go to die, backed by one of the worst defenses in baseball. The Orioles offense last season was surprisingly mediocre, rating in the middle of the league in runs scored, even outscoring Tampa Bay. 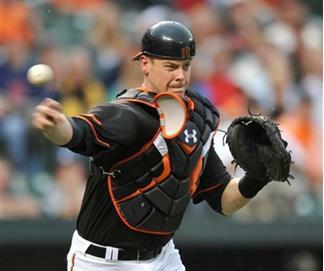 Matt Wieters had a breakout 2nd half and his defense was superb last season, garnering him the Gold Glove. He has a rocket arm behind the plate and he is quick to throw to 2nd, catching 37% of stealers a year ago. He’s a good bet to hit 30 home runs and drive in nearly 100 RBIs. Mark Reynolds is also back to reprise his 30 homer/200 strikeout routine. The JJ Hardy will be hard pressed to repeat his 30 homer season but 25 shouldn’t be out of the question, giving the Orioles some good pop at shortstop. The pitching staff was easily the worst in baseball last year, allowing nearly 60 more runs than anyone else for a staggering 860. No starter even rated as league average, granted Mark Reynolds was single handedly killing the staff with his atrocious defense. Last year Reynolds topped all of baseball in errors for the 3rd time in his career with 31. Reynolds has little range and looks as if he is trying to field the ball with oven mitts on his hands. Even when he makes a clean play he is prone to overthrow first badly, giving the opposition extra bases. To look on the bright side, the good news is that most of the O’s 2012 staff is young or completely unproven. Zach Britton showed promise a year ago but even his numbers were rough. It was only 2 seasons ago that Brian Matusz was a highly rated prospect who finished 5th in the Rookie of the Year voting. Wei-Yin Chin and Tsuyoshi Wada could offer some cheap value or just as easily implode. Chen has been a fairly dominant pitcher in the Nippon Pro League who has a slider forkball and 87-91 mph fastball. Wada has a fastball that sits between 84-88 mph and could have some issue with getting hit hard and doesn’t appear to have starter material in the MLB. Some potential is here but the Orioles will probably allow the most runs in baseball again, guaranteeing them the cellar for another year. This division will be a dogfight and could be won by either New York, Boston, or Tampa. I think that all three of these teams will be a threat to win 90 games and the AL East will capture at least 1 Wild Card spot. I like New York to finish on top because they have pitching depth to rival Tampa Bay and offensive fire power on par with the Red Sox. Tampa will probably boast a league average offense leaving them vulnerable to missing the playoffs, and if Boston doesn’t get their pitching situation straight they could miss the playoffs for a 3rd straight year. Until Toronto and Baltimore improve their pitching situations neither team will be a true contender, although Toronto has the firepower to again finish around .500. This division has 3 potential World Series teams, and if either Boston, New York, or Tampa fit all the pieces of the puzzle together, look out.